If you were a fan of "sim management" games in the early 2000s, you probably played at least one version of RollerCoaster Tycoon. 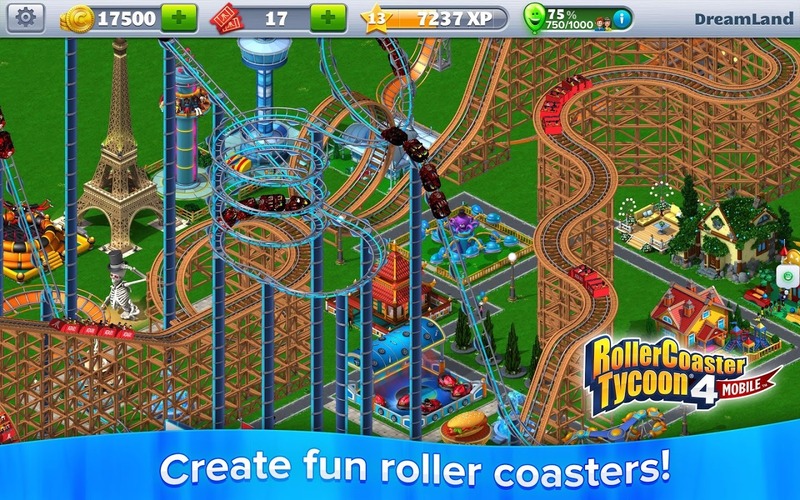 Next year Atari will revive the franchise with RollerCoaster Tycoon World on the PC, but for now the official fourth installment of the series is oddly limited to mobile, arriving about six months late on Android. 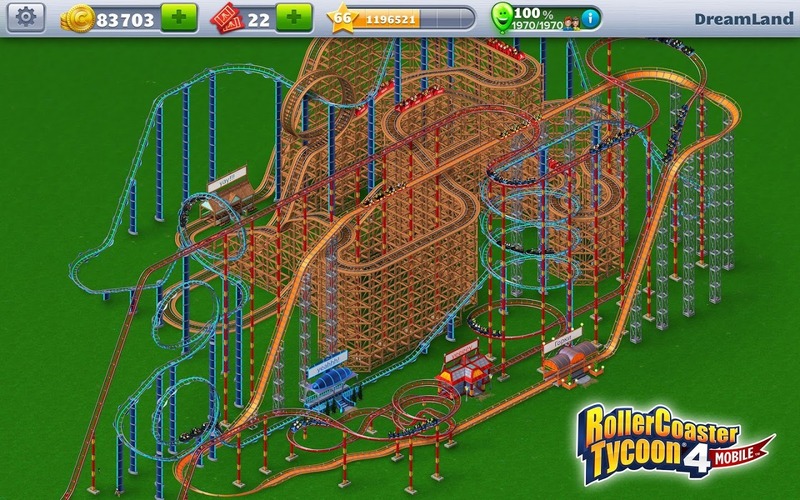 RollerCoaster Tycoon 4 uses the same basic structure of the original 1999 game, albeit with remixed limits and annoyances for the free-to-play format. 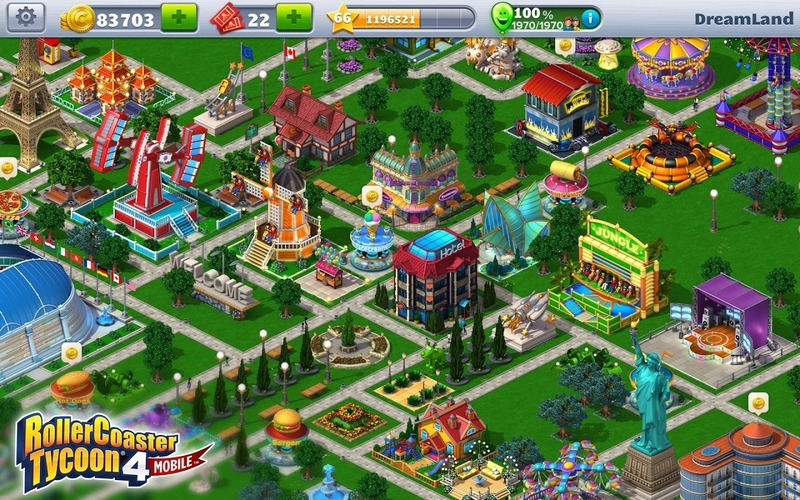 At its heart, the game is an amusement park simulator, basically SimCity with attractions instead of buildings. It's your job to keep your park expanding and profitable by strategically selecting and placing rides, food stalls, and infrastructure like bathrooms and gift shops. The more attractions you make and upgrade, the more money you pull in, and the more you can build. The biggest attractions are, of course, the roller coasters. (That's two words, game, the spell check on your title is driving me crazy here.) You can select a basic design and customize it by choosing the individual track segments, creating truly insane works of theme park art... if you've got the money. Tracks come in a variety of materials from old-fashioned wood to expensive carbon fiber, and the more interesting additions like loops and corkscrews can really drive up the price. Of course, the bigger and better your ride, the more money it will earn for your park. 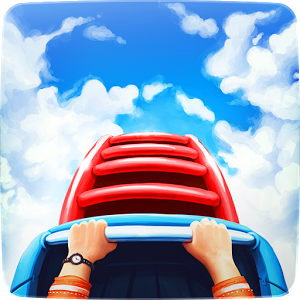 The controls for the customized roller coasters are very tricky on a touchscreen - I can't help but imagine they'd be easier with a mouse and keyboard. 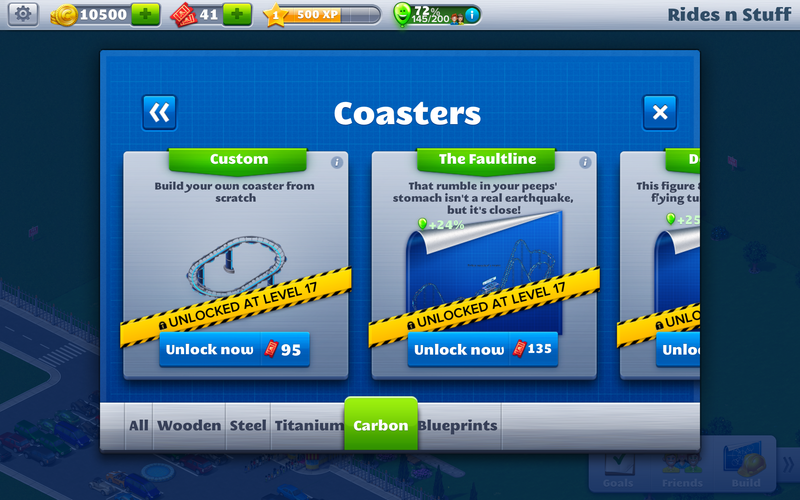 Alternately, you can press a button and have the game complete the coaster for you. RollerCoaster Tycoon 4 Mobile makes the usual concessions (ha!) to the free-to-play structure. 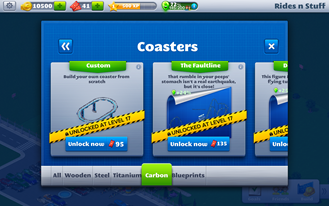 Most of the basic buildings and coasters can be bought with standard in-game cash, but the really cool rides (and sometimes even the more interesting parts for rides) can only be had with "tickets," the game's premium currency. You can find them by grinding through levels, annoying your Facebook friends with invitations, or (of course) buying them with real money. 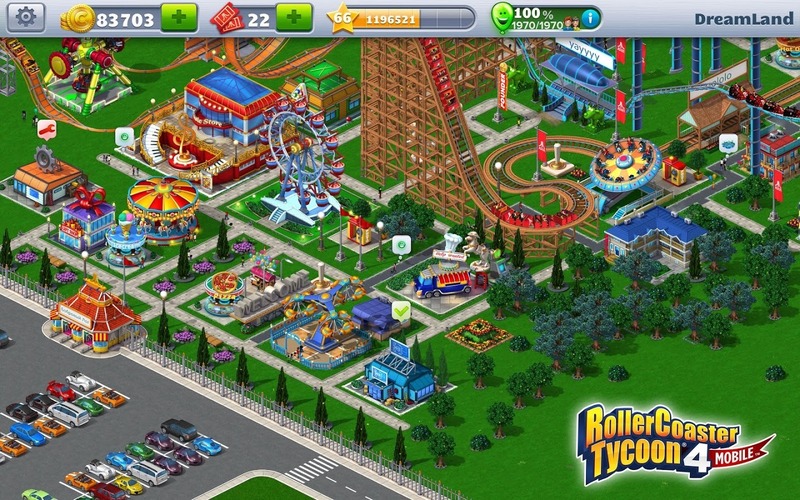 The game's coolest rides require either days of grinding or about $25 worth of virtual currency. 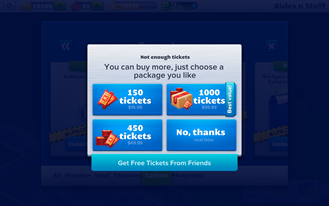 Buildings also take time to erect, but can be instantly completed with more tickets, adding an annoying "power" element. The game was initially given poor reviews on iOS, where it launched as a paid title. Perhaps the "free" approach on Android will allow gamers to be a little more forgiving.